“O” week went very well across all our campuses. I really want to thank all of those involved, in particular thanks to Mary and her team from the Student Centres. It was great to catch up with so many new students. We are really very privileged to be able to partner with people who are working so hard for their future. The highlight of “O” week for me was meeting with parents on Tuesday evening. The evening was a chance for parents to ask questions about their children going to University. I have to admit that I could have answered about 1% of the questions. Thank goodness the staff from the Student Centres were there with all the right answers. I think I learnt more than any of the parents! This was the week that the medical imaging (radiogrpahy and ultrasound) programs were launched. Cynthia Cowling has done a fantastic job in getting these programs ready. We are getting very positive feedback from the community about these programs. A lot of work has been done with the professional bodies and with the industry. These programs should give us about another 100 students next year in Mackay – this will pipeline up to 300-400 in the longer term. Great news! Look out for more announcements of new programs in the very near future. We are now really focusing on the preparation of the AUQA audit. We have already done a lot of work for this. In the next few days I will be announcing the structure and team that will take us on the final part of the journey to the audit. As I have said before we have a lot to be proud of and this is our big chance to show off all that is good in the University. It is also a chance to sort out anything that we could be doing better. I hope that everyone will have done the Voice staff climate survey. I really want to know what you think of working for the University and how we can make things better – have your say! Professor Qing-Long Han, Associate Dean of Research in FABIE, has been appointed a prestigious Chair by China’s Ministry of Education, the Chang Jiang (Yangtze River) Scholar Chair Professor in recognition of his outstanding contributions in the field of Control Theory and Control Engineering. What fantastic news. There are very few of these appointments in Australia. This is just another example of how we are attracting the best people to our University. Today I am interviewing for the DVC University Services and PVC Teaching and Learning. These will be very important positions in our team for making the University great. Have a really great weekend and get ready for the first teaching week. Speaking of 'back to the land of OZ' what is CQUni doing in terms of advocacy for our regional communities. As the most engaged university for Central Queensland, are we advocates for our regional and remote areas? It seems that many communities in regional and remote Queensland are highly disadvantaged and vulnerable communities - for instance, results in AEDI and NAPLAN are demonstrating how at risk and vulnerable regional communities/children are. How might our regional campuses turn this around? Should the role of CQUni include action and visibility in matters of advocacy? Anna Bligh's Green Paper 'A Flying Start for Queensland' currently is seeking university responses about various proposals. I understand that people in the Education Faculty are preparing a response, but will this response be highlighting the needs and challenges of our regional communities? Should we see advocacy as an important feature of 'engagement'? Do we care about the kids, youth, families, parents, learners, communities in our footprint? How are we demonstrating this? How are we commmunicating this? How do we make things better for our regional and remote communities"
I thought this was important and was worthy of re-posting. I would be interested in hearing what people have to say about this. I worry that advocacy can mean that you are acting as the voice for a weaker party. I think engagement should be more about enabling our communities to become strong so that they have their own voice - rather than having another party "advocating" for them. What do you think? A river ran through it! “O” week is upon us. This is always a very special week when we see the campuses come back to life after the long Summer break (I know that many of you have been working hard over the break – but there have been few students about). It is great to see all the egger faces waiting to start their programs. They trust us with a great deal of responsibility. They have chosen us over all other universities. About 3000 new students will join us today – I think they have made a good choice. All our campuses are up in the number of students starting today – well done to all those involved in this great success. 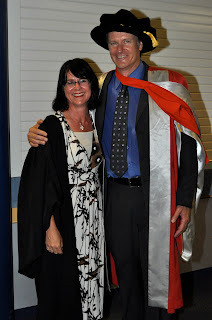 Last week saw the graduation in Rockhampton. Over 60 staff were up on stage and many of our professional staff were in the audience. Many thanks to all of you – your presence means a lot to our graduates and their families. I urge all staff to try and attend graduations – it is a chance to see what you have achieved. All staff have made a difference to the lives of those graduating. The stars of the evening were William McInnes and the river running through the marquee. This is a picture of the Director of my office Jenny Roberts with the actor – strange that she has never wanted her picture taken with me! We are starting to get good response to the Voice climate survey. I am looking forward to hearing how staff feel about working at CQUniversity. I am even more looking forward to working with you to improve the experience of staff. Feedback is important in all aspects of the University’s functioning. I think we need to do a lot of work in embedding feedback and improvement into all our operations. All stake holders need to have a say in what we are doing – and we have to improve based on that feedback. I think this will be another important theme for 2010. It is a good week for me family wise. My daughter Anneka is here with our seven week old grandson Owen. I had forgotten how much work is involved with a young baby. I really do empathise with all of you who are working for or studying at the University with young children. You are stars! Sunday morning was spent at another private University – Yarmouk Private University (YPU). This is a University which is situated about 40 minutes drive from the Centre of Damascus. It is a new University which has only been operating for about a year. It has 500 students and is growing very rapidly. The University has a very impressive campus and has big plans for expansion. We met with the President, Professor Dr. Mhd. Fayez Kiwan, the Dean of Informatics and Communication Engineering, the Dean of the faculty of Architecture and Civil Engineering and the Manager of Students Affairs. We discussed a number of ideas for how our two universities can work together. We came away thinking that we would work with the YPU in the future – both within Syria and Australia. I think there is a good chance that we will be seeing academic and professional staff from YPU visiting CQUniversity in the future. I also think that there will be a chance for staff from our University to visit YPU to deliver intensive programs. After the visit to YPU we travelled to our hotel to pick up our bags and travelled to the airport. Damascus airport has to be one of the most chaotic places on the face of the earth. The airport was a queue free zone – the scrum was the order of the day. There was failure in the airports electricity system – and they had great problems printing out our boarding passes! We left Damascus about three hours late. We arrived back in Dubai at past midnight. We were up early on Monday to get to the airport for our flights. So on Monday I said goodbye to Ken, Geoff and Ali. It really had been a pleasure travelling with these three colleagues – and I had learnt a lot about the CMS operations. I spent most of Monday on a flight to Singapore – arriving at about 10.30pm. Tuesday started with two breakfast meetings (time for a big diet when I get back). The first of these was with a group of our Alumni. The leader of the Alumni group is Dr Vincent Wee. I have known Vincent for a long time – he used to work for JCU Singapore – so it was good to catch up with him. Other Alumni at the meeting included Tina Shum, Valerie Wee and Chris Pan. We discussed ways in which we can interact with Alumni in Singapore. The group were keen to form a proper Chapter. If academic staff are passing through Singapore they should, if possible, meet with the Alumni group and consider giving a lecture. We also discussed the possibility of a group coming out to Rockhampton for the next University Ball. This will be a chance to show off the University. I will be discussing these plans with the Development Unit when I get back to Rocky. After this meeting I visited the CQUniversity campus in Singapore which is operated by Melior Education Group. I was very impressed with the professionalism of the operation. I was shown around by the Melior CEO Patrick Loke. Along with other members of staff I also met with another Director of Melior – Mr S. K. Cheng. We discussed ways in which we could grow the operation in Singapore. There is potential to do more. I am very keen to see Melior Group and CMS working more closely together in the future – there are great synergies between the operations. I then had a lunch meeting with the Melior Academic Board. This Board is chaired by Dr Mathew Yap. The other members are Dr Carol Balhetchet and Dr Tan Kok Heng. All members of the Board are Alumni of CQUniversity. Dr Balhetchet is a well known personality in Singapore. It was a very pleasant meeting with the Board members explaining their role and their aspirations for CQUniversity in Singapore. It was then off to the airport to catch a flight to Brisbane. I arrived at my hotel at about 3am. I was then up after about three hours sleep to attend a meeting with the VC at the University of Queensland. I am writing this at Brisbane airport – waiting for my flight to Rocky. I have a full afternoon of meetings and then an official dinner meeting this evening. If you think I am looking for sympathy – you are right! So was it worth it? From a financial point of view - probably yes. The outcome from the meeting with the UAE Ministry of Education alone should cover the cost of the trip many times over. But it was also worth it to raise the profile of the University and to form links with other Universities. However this will only have benefit to the University if we follow up on all the opportunities which have been identified. I will be reporting back to you in the coming months regarding outcomes. But that is only my point of view. I would very much appreciate the CQUniversity community’s response to this trip. I hope you have enjoyed this insight into my travels as the VC. I will endeavour to report back to you in this manner whenever I travel. Friday is our weekend – so we had a day off from visits and meetings. The University of Damascus very kindly provided us with a driver and tour guide to take us out for the morning. We visited Ma’alula. This famous village is some 56 km from Damascus, and is situated at an altitude of more than 1500 metres. Its little houses cling to the face of an enormous rock; they look suspended in mid-air. There are two monasteries here; Saint Sergius and Saint Taqla's.The inhabitants still speak Aramaic, the language spoken by Christ. If you are interested in Ma’alula you can find out more at: http://www.lingolex.com/maalula/maalula.htm. If you ever get to Syria I would strongly recommend that you visit this fascinating city. On the way back one of us asked our guide "Where is the Road to Damascus” – he simply said “You are on it”. It is strange to think we were on the road that St Paul travelled so long ago. As we drove through the city we stopped by the old city walls. Our guide pointed out a small window in the wall near one of the gates. He told us that this was the window that St Paul had jumped out of to escape the Romans. This is a city where people describe structures that are a thousand years old as “modern”. There is history everywhere going back 4000 years. In the afternoon Ali kindly took us to the Umayyad Mosque. You can find out more about the Mosque at: http://en.wikipedia.org/wiki/Umayyad_Mosque. It is one of the largest and oldest Mosques in the world. It was build in 705AD and took 10 years to build. We wandered around inside the Mosque taking in the very special atmosphere. Syria is a very friendly and safe place to visit. We have walked around the city and at all times have been made to feel welcome. This will come as a surprise to some people – but I can honestly say I have never felt more comfortable or safe in a country. This is in complete contrast to a trip I made to South America a few years ago. I am sure this visit will generate quite a lot of activity for CQUniversity. If this leads to a chance for you to travel to Syria I would recommend that you take it without hesitation. I know I want to come back here on my “own time” in the near future. Our one day weekend came to an end and we were back at work on Saturday. On this day we visited one of the largest private universities in Syria – the Arab International University AIU. The University has about 4500 students and five faculties Pharmacy, Civil Engineering, Architecture, Fine Arts and Informatics Engineering. The University is only five years old but is growing very fast. We visited the University on a very interesting day. They were holding a ceremony to celebrate the start of an intensive workshop entitled “New Challenges in Drug Delivery Systems”. This workshop was being delivered by the Martin Luther University from Germany. So there were a number of German visitors. We attended the ceremony and the Deputy Minister for Higher Education was present. We had a chance to meet him after the ceremony. During the day we had meetings with the President of the University Professor Dr. rer. Nat. Abdul Ghani Maa Bared. He was very generous with his time and we discussed ways in which our two universities can work together. During the day we also met the Vice President Professor Dr. Faek Diko, Professor Dr. Abdul Razak Cheikh Issa the Vice President for Quality & Academic Accreditation, the Dean of University Requirements Dr T. (Jack) S. Toumajian and the Head of International Office Dr. Dr. h. c. Thomas Teuscher. We asked why Dr Dr – he told us that one PhD was in Arabic and the other was in English. We came to the conclusion that there were many ways that our two universities could work together. They would like us to run intensive workshops. They would like our staff to visit their university. They are happy to cover the expenses for these trips. We also want to look at the possibility of joint degrees, joint research, and student and staff exchanges. Once I get back to Australia I will be talking to the PVC Faculties and CMS about how we can pursue this relationship. We will be looking to sign a MOU with this University. In the evening we were invited out to a dinner by the President of the University. At this event we also had the chance to meet with the Chair of the Board of University Trustees Dr. Mohammad Imady. He is also the Chairman of the Syrian Commission on Financial Markets and Securities. The University was very generous with their time and hospitality. I hope we will be able to work with this University in the future. I am writing this entry on my weekend – Friday. Everything is shut here and we have a free day – so we are heading out to the hills. There is some worry that where we are heading will have the roads blocked by snow – we will see. I will report on our day off tomorrow. Saturday and Sunday are working days here and we have appointments booked – so I am going to make the most of my Friday weekend. But before I do let me report on the progress we made yesterday (Thursday). The day was one of busiest and most important of the trip. We started the day with a meeting with the Minister of Higher Education Dr Ghias Barakat. It was quite exceptional that we managed to get such a high level meeting – it was the equivalent of meeting Minister Julia Gillard in Australia. Our success in getting this meeting was due to the Syrian Ambassador to Australia and New Zealand His Excellency Mr. Tammam Sulaiman. You may remember that he gave a lecturer to the university last year. He has turned out to be a really good friend to the University and has opened many doors here in Syria. The Minister was very welcoming, giving us a very detailed briefing regarding advances Syria is making in higher education and the part that overseas universities can play. There are certainly a number of opportunities for us to host Syrian students in the future. We also met with the Director of International Cooperation Samer Al Belal and other officials. We came to an agreement with regards to how we can pursue a relationship with the Ministry of Higher Education. From that meeting we travelled to Damascus University. There are only four State Universities in Syria and Damascus University is the oldest and largest. It has 120,000 students and is over 100 years old. We had a meeting with the Vice Chancellor of the University, Professor Dr Wael Mualla. Again it was quite rare for a delegation to get access to the Vice Chancellor of such a University. We had a long discussion with the Vice Chancellor about how we could work together. We discussed a possible memorandum of understanding (MOU) between the two universities. To be honest I am not keen to sign lots of MOUs all over the place. I want to keep the number of MOUs that CQUniversity has down to a few select universities. This is so that they are meaningful and lead to action. MOUs for the sake of MOUs are a waste of time. I would however like a MOU with Damascus University. We decided that later in the year we would arrange a virtual conference between the two universities. Two of our researchers and two of Damascus University’s researchers will present papers that will be transmitted by video conference and internet. I will be working on this when I get back. I will also be looking to provide a travelling scholarship for a member of staff to travel to Syria to work for a short period of time with a Damascus University member of staff on a joint research project. We will then look at staff and student exchanges. But I think we will only get these activities happening if we have contact and cooperation between academics. We went on to discuss other areas of cooperation. I will be talking with a number of our academics when I get back with regard to how we can interact with this important University. We also met with Noubough Yassin the Director of International and Cultural relations at Damascus University. She will be central to any relationship that develops between the two Universities in the future. After visiting Damascus University we were off to another Ministerial meeting. This time it was with the Minister of State for Environmental Affairs Dr Kawkab Alsabah Dayeh. Also present at the meeting was Eng. Imad Hassoun the Deputy Minister. This was a very important meeting. We discussed in detail how our University and in particular the Centre for Environmental Management can provide assistance to the Ministry. When I get back to Australia I will be having a long chat with Professor Rolf about how we can interact. The Minister was very interested to hear about our plans for a virtual conference and suggested that we may want one of the topics for the conference to be Environmental Management. From this meeting we were taken on a tour of old Damascus. This had been very generously arranged by Damascus University. Before going on the trip I put on every piece of clothing I had. It is just so cold over here. We then went on an early evening walk with a guide through the old city. Damascus is the oldest continually habituated city in the world – dating back over 4000 years. It is a fascinating city and I am very hopeful that more of my colleagues from CQUniversity will be able to visit. Our day was not quite over. We were invited to dinner by Professor Dr Wael Mualla. At the meeting we also met with Professor Dr Hyam N. Bashour who is Professor of Epidemiology and Community Medicine at Damascus University. We spent the evening discussing how our Universities can cooperate. It was also interesting to hear that the issues that I am facing are exactly the same as the ones being faced by the VC of Damascus University. For example I was telling the VC that we needed residential accommodation on some of our campuses that do not have it. He told me that he too needed more accommodation. I asked him how many student beds he had at his university – 13,000. Same issues different scale….. Yes it really is snowing here. Yesterday (Wednesday) was a travel day. We drove the couple of hours from Abu Dhabi to Dubai and then it was a three hour flight to Damascus in Syria. It was one of those frustrating days you have when you are travelling for work – you get a glance of a place – but have no time to have a really good look. Dubai is somewhere I would really like to spend some time in – but alas it will not be on this trip. Work trips are mainly about airports, hotels and other universities. That is not to say that such trips are not enjoyable – they are! In terms of holidays and personal travel I think work trips can be helpful “spotting” trips. I get a glance of somewhere and put this on my list of places to go back to on holiday with Anita (my wife). Personally I have never been able to mix business travel with personal travel; hence Anita has very rarely travelled with me on work trips. I know others manage to combine the two – but I never have managed it. I find I cannot concentrate on a meeting knowing that Anita has been left alone. We have always found it better go back to the place that I have spotted – together. jacket – but I am still freezing! So, yesterday was a travel day. If you are on your own these are wasted days – but not if you are travelling with colleagues. It has been a great pleasure to travel with Ken, Geoff and Ali from the CMS. I feel I have got to know them and to understand the International Campuses much better. This always happens when you travel with people – you have time to talk and get to know the person rather than the position. Just like a personal holiday you have time to dream. So we have been dreaming up lots of ideas of how the University can go forward. There was also time for Ken to brief me on his recent trip to Saudi Arabia. His feedback was that CQUniversity fared well at the International Exhibition for Higher Education in Riyadh. The CMS team represented the whole of CQUniversity. They put particular emphasis on the Central Queensland campuses as compatible destinations for Saudi students. Significant interest has resulted in applications for engineering, IT, nursing and doctoral programs. I think the University can expect to see these applications coming through in the near future. We all need to work to turn these applications around very quickly. The international market is VERY competitive and the sooner we can get offers out, the better. So I would encourage staff in Faculties and Divisions to work really hard and fast to convert these applications to offers and then on to students. We have a lot to offer – we don’t want these potential students missing out! The great news for and about these students is that they will come with full funding from the Saudi Ministry of Education and /or other sponsors. It is great to see CMS and the International Office of the University working so closely together. This is leading to some great results. So why am I so late posting today – well I now have an eight hour time difference between me and home – and only a two hour difference with the UK. That coupled with the snow makes it feel a long way from home. Tuesday has been another interesting day. We spent the morning at the Abu Dhabi Men’s College (which also has female students). This is part of the Higher Colleges of Technology. We were shown round by Dr Simon Jones, the Director, and Dr Erik Forsberg, the Associate Dean, Research and Innovation. We were also very pleased to be greeted by Dr Tayeb A. Kamali, the Vice Chancellor of the Higher Colleges of Technology whom I had met the previous evening. In Australia we would call this College a multi-sector University. It awards diplomas through to masters degrees. It has strong links with some of the great Universities of the world including Stanford, Harvard and London. Many of its degrees are being delivered in conjunction with these universities. The Abu Dhabi Men’s College is impressive to say the least. It is one of the most technically advanced institutions that I have ever visited. We were made to feel very welcome. It was a little disconcerting to find every screen throughout the College displaying a picture of me and a welcome! The library was particularly advanced with cutting edge learning technology. The library was the learning heart of the College. We were shown how students are using IT to access learning material. We were impressed to find that they were using this blog site to demonstrate their technology. They really had done their homework. We were shown their new allied health building. They are delivering programs in nursing, medical imaging, medical laboratory science and paramedics. Many of the areas we are looking to start. There was a willingness on the part of the staff in this part of the College to collaborate with us. The aviation technology section of the university was of interest to me – for obvious reasons! They had three aircraft in one of their workshop. They deliver programs for aviation technicians. They are now looking to put together a program in aviation management. They were interested to learn that we were already doing this. I think there could be some important links in this area. I hope Ron Bishop will be able to follow up on this. Dr Erik Forsberg is working to consolidate the research efforts of the College. I have invited him to visit CQUniversity to see what we have done this with our research institutes and centres. He will be contacting Jennelle Kyd about this visit. The College also has a centre for Excellence for applied Research and Training CERT. It would be well worth taking a look at the CERT web site at http://www.certonline.com/ . CERT is the commercial arm of the College. It was stunning to see the equipment in this centre. They have a super computer that is in the top 400 fastest computers in the world. Our researchers could access some time on this computer to deal with large complex data sets. It also has one of the three most advanced simulation centres in the world. When we were there it was running a simulation of an oil refinery. Just think what we could do with one of these in partnership with industries in Central Queensland! The College is just starting to get into railway engineering. They were very interested to hear that we were a leader in this field. They are very keen to look at a relationship in this area. I will be following up on this when I get home. There are many possible links that could be made with this College. In particular I think we should be looking to make links with them in railway engineering, allied health, aviation and through our Professional Doctorate program. We have received a letter of intent from the College to follow up on some of these areas. In many ways this College is very similar to us – even if it is better resourced. I think that a relationship with this institution could be considered to be a peer to peer relationship. This could be very important going into our future. I would urge colleagues to take a look at their web site at http://www.hct.ac.ae/ . We discussed many issues – but the main one was the award of ADEC scholarships to UAE students who are studying at our international campuses. We have had a few issues with this in the past. I was very grateful to Mona Majed Al Mansoori for explaining to me the rules regarding these scholarships. It seems that they are only given to students studying in Australian universities which are ranked in the top 200 universities in the world. We are not quite there yet! There is however a chance to get such students if we can show that we are the best place for them to study in Australia. So there is a chance that we could get some of these students studying in our areas of excellence – such as railway engineering. We will explore this. There are also opportunities to offer study options to the high school students that ADEC sends to Australia each year. This is particularly about English language studies, which will be worth exploring. We had a very interesting discussion with Bob Turner about VET opportunities. ADEC is just starting to consider sending students overseas for VET. We are starting to have discussions with CQ TAFE about how we can work more closely together. As this relationship develops there could be great opportunities to work with ADEC. In the evening we had dinner with a former student – and his brother, who is going to attend CQUniveristy Melbourne later in the year. They were fascinating company – and we had a really stimulating discussion about differences between living in Australia and the UAE. Driving through the UAE is like being on the set of Top Gear. There is just about every super car driving about the streets. On the way back to the hotel we had a competition to see who could spot the most interesting car – Geoff Wessling won with a Bentley Continental GT Speed. My computer was not downloading email earlier on. I hope this is still the case – it will give me an excuse not to clear emails. So I am off now - to either do emails – or to go bed! Over the next few days I intend to write a detailed blog about my first trip overseas for CQUniversity. My reasons for this are many and varied. I want colleagues to understand what I do when I am travelling overseas for the University. It is very easy to see these trips as junkets with senior staff giving themselves an excuse for an all expenses paid holiday. I know I used to think this when I was a lecturer killing myself to get ready for a new term or when I was up to my eyes in marking! So, I want to set out exactly what goes on during one of my trips. I want people to have the information they need to make judgements on the value of this activity. It is up to you to judge – junket or valuable University activity. I also want colleagues to see if there any opportunities to get involved with this fascinating part of the world through my visit. I do hope to show that there is a lot of difference between a work trip and a holiday. That is not to say that work trips are not enjoyable. I know that I am very privileged to be able to travel and see parts of the world that I would never get a chance to – unless I was in this line of work. And of course there are fun parts of trips! There are a number of downsides to this kind of travel. You are away from family – and you miss valued “weekend time” with them. It is also hard to stay on top of emails and what is going on back at base. I am writing this entry from Abu Dhabi in the United Arab Emirates (UAE) on Monday at about 10.30pm local time. It has been a busy start to the trip. I left Rockhampton late on Saturday afternoon and arrived in Dubai at 5am local time (11am Queensland time) on Sunday morning. I was met by Dr Ali Abusalem a very close friend of CQUniversity. He has been a great help in promoting the University in the Middle East. We drove the 140km to Abu Dhabi. Much of Sunday was taken up with meetings with Ken Hawkins and Geoff Wessling from CMS. They gave me feedback on their visit to Saudi Arabia to market the University which they had undertaken the previous week. We also took some time to plan our meetings for the rest of the week. After a lost night's sleep on the plane and a 6 hour time difference I was very happy to be heading back to the hotel after dinner at about 10.30pm. Little did I know that I would not see my bed until well after midnight! Earlier in the evening Egypt had won the African Nations soccer cup. This brought the Egyptian ex-pats out onto the streets of Abu Dhabi in force. There were massive traffic jams throughout the city. It was a very happy city! I can honestly say that I have never been happier to get to bed after such a long day! Monday was a very rewarding day. I visited the United Arab Emirates Ministry of Higher Education and Scientific Research. I met with Dr Saif AL Mazroui the Executive Director for International and Support Services. I briefed him on the direction that CQUniversity was taking and how we could work together. I am very pleased to report that we have been put onto the list of approved Australian Universities for UAE students. This is very important if we are to get more students studying with us from the UAE. I also met with Professor Dr. Samir Abdalla Eldessouky an advisor to the Ministry. He gave me a briefing on progress being made by the Universities in the UAE. There is no doubt that these Universities are making great progress. I am hopeful that we will be able to work with the UAE Universities in the future. I also met with senior staff from the scholarship section of the Ministry. We discussed a number of issues. This was important because the UAE sends many of its young people overseas for higher education. I think our university has a lot to offer these students and I hope to be seeing many more of them at CQUniversity as we move forward. After my visit to the Ministry I went back to the hotel for a meeting with Ms Gabrielle Troon the Manger, Education Services for “Study Melbourne” from the State Government of Victoria. We discussed issues facing higher education providers in the UAE – in particular those providers (like us) who are bringing students into Victoria. This evening I had a pre-dinner informal meeting with Professor Jim Mienczakowski from the Abu Dhabi Education Council (ADEC) and a former CQUniversity staff member. We were joined by Dr Robert Thompson Head of Special Projects at ADEC. He is also a former CQUniversity member of staff. I briefed them on how we are progressing as a university. I was then very privileged to be a guest of His Highness Sheikh Nahayan Mabarak Al Nahayan. Sheikh Nahayan is the Minister for Higher Education and a member of the Royal family. It was a fascinating event. We ate camel and other UAE delicacies. There were four nobel laureates at the dinner! Over dinner I had a chance to discuss issues with Dr Tayeb A. Kamali, the Vice Chancellor of the Higher Colleges of Technology. This is a university with 17 campuses 18,000 students. He was very interested to hear that we have an expertise in railway engineering. His university is just starting to get involved in this field. There is a plan to build a national railway across the UAE. After dinner it was back to the hotel to write this blog. Once I have put this to bed I will try and clear some emails! The United Arab Emirates is a fascinating place. It has rich mineral wealth (mainly of the black liquid form) and has challenging training and educational needs – does that sound familiar? There are many similarities between the UAE and Central Queensland. I am convinced there are many opportunities to build links with this part of the world. The people here are gracious and generous. 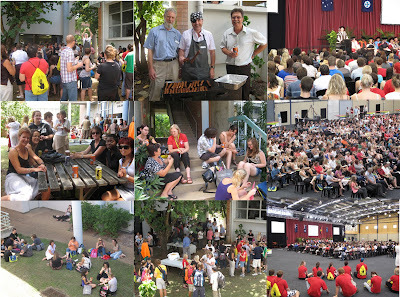 There are many alumni of Australian Universities who have a deep love of Australia. This is a great place to come and see the value of international education.